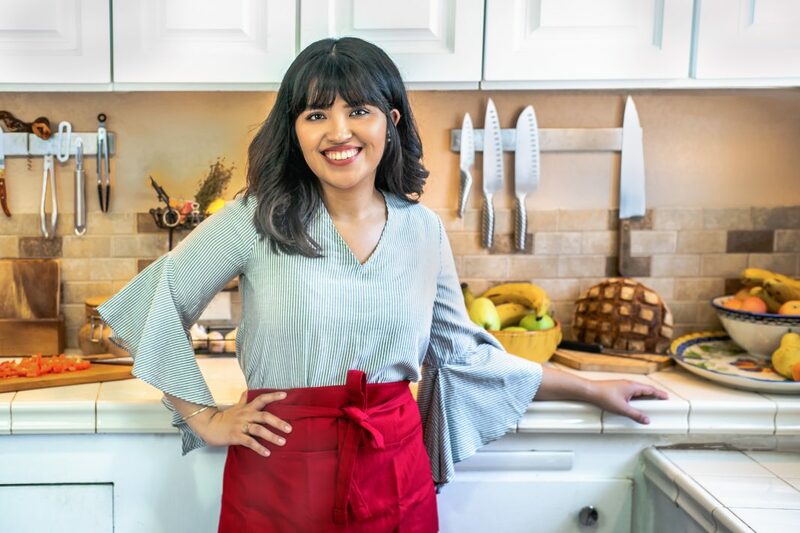 Karla T. Vasquez began documenting and preserving recipes passed down from generation to generation back in 2014, and it wasn’t until 2016 that she took the leap to create a website and start her Instagram account @SalviSoul–a cookbook storytelling project. In 2017, she left her job to pursue the project full-time. “Since then it’s been a rollercoaster of a ride,” she says. While she’s still in the process of finishing up a book proposal for SalviSoul, Vasquez is doing the work as a food justice advocate and proponent for healthy food accessibility in low-income communities. She’s also contributed to Teen Vogue, Eater L.A., L.A. Taco, and other publications. This Sunday, April 14, Vasquez will be at the Los Angeles Times Festival of Books as part of a panel on cultural preservation through writing, curated by L.A.-based writer and researcher Marty Preciado. We talked to Vazquez about her inspiration behind starting SalviSoul and the journey its been documenting generations of recipes. Can you speak more on what inspired you to create SalviSoul? I tend to talk about it in kind of these macro and micro reasons. So some of the big reasons, of course, are that I was born in El Salvador. When I was growing up here in L.A., I always felt this lament. It was this lament that I didn’t have access to my story, to my narrative, and growing up I just constantly felt this sadness and longing. I always had this longing to understand El Salvador, it was this mystery to me [and a place my] parents talked about with so much nostalgia and so much love. But it was [also about] reconciling with the fact that we left because it was a very violent place. Trying to make sense of all of this was a huge part of what prompted me to want to learn more about where I cam from. I didn’t expect that it would look like this but trying to understand my parents and where they came from is a big reason as to why I started SalviSoul. I became a citizen when I was 18 and it was a really great moment for me because I felt like, “OK I finally belong here.” But now I had this added dimension [and started to] feel like I didn’t belong to El Salvador anymore. Sometimes we associate our identities with a passport or documentation can be a huge part of our identities and you know sometimes our language is what helps us tell the story of who we are. And of course, I’ve struggled with Spanish in different points of my life but I constantly felt refuge and safe at the dinner table. So when I start to think about how much food was an anchor in my life growing up… I realized I know who I am because I know that my grandmother makes pupusas on the weekends and that’s what we ate back home in El Salvador. But then in my early 20s, I was diagnosed with Type 1 diabetes. The first thing that I heard was, “it’s all about food and about what you eat.” So all of a sudden, this relationship that I had with my culture through food was being threatened and I had doctors who would say, “you maybe shouldn’t eat tortillas, or have platanos because that’s too starchy.” It was a very depressing time in my life because those were the things that let me feel and be Salvadoreña, those were the things that grounded me, and those were the things that I could share with my family. Those were the cultural gathering points for me that were so crucial. I don’t think I had the idea of [SalviSoul] right then and there but all these things compounded into learning more about Salvadoran food in general. I realized I really had to get in the kitchen, start cooking my food and understand what was in it. I then enrolled in a cooking school program, and I think it was there where it all definitely clicked and I realized what I had to do. How did you start the process of documenting recipes for SalviSoul? You know, all this time I had been lamenting this lack of my story and lack personal narrative out there in mainstream culture and it appeared that all I had to do was document it. I realized that I had to document these recipes but also that it would be an incredible injustice to only document the recipes because the people who have kept practicing them are mostly women and we have incredible stories of perseverance, determination, wisdom, love–and those are food, too. And it’s taken generations to cook that story. For me it was really important to talk about you know, the culinary contributions we add to the world. So, that’s what prompted starting SalviSoul. I interviewed 25 women [for SalviSoul], some of them are family friends, and of course my family. But the majority of them are people I found online, or who reached out to me. I also tried to be very careful because I wanted to make sure that this is a platform that’s theirs. Gathering stories about Central American narratives can be very tricky. There’s a lot of pain, right. So I wanted to make sure that I wasn’t being pushy just to get the story. I didn’t want to take anything from the women who have given so much already–that’s why I’m intentional about working on their schedule, buying the ingredients when we’re recipe testing, and create a safe space for them. How did you feel when you found out you’d be part of a panel at the Los Angeles Times Festival of Books? I’m super honored to be a part of this panel, but the fact that it’s three Salvadoran women writers is so historic. I was talking to a friend who’s from El Salvador and recently moved out here to L.A. and when she saw the news, she said, “Karla, you have to know this happen often in El Salvador. We don’t get that type of visibility as women professionals doing this work.” So, I mean, to just see and witness that it’s happening is incredible. It’s great when you work with people who are really interested in moving and interesting in bringing the rest of the community with them. Marty [Preciado] is so incredible for being such a thoughtful curator–she’s an incredible illustration of what allyship can be. Putting a panel together like this expands what a Latinx person is. You know, it’s also a Latina who is a poet and talks about her modern day love story, or a food historian who talks about food culture is the final frontier in some ways for cultural preservation because you can practice it every day. Karla T. Vasquez will be part of a panel, “Cultural Preservation Through Writing,” curated by writer and researcher Marty Preciado, along with Yesika Salgado and Yeiry Guevara. The panel will take place Sunday, April 14, at 10:30 a.m. to 11:30 a.m.